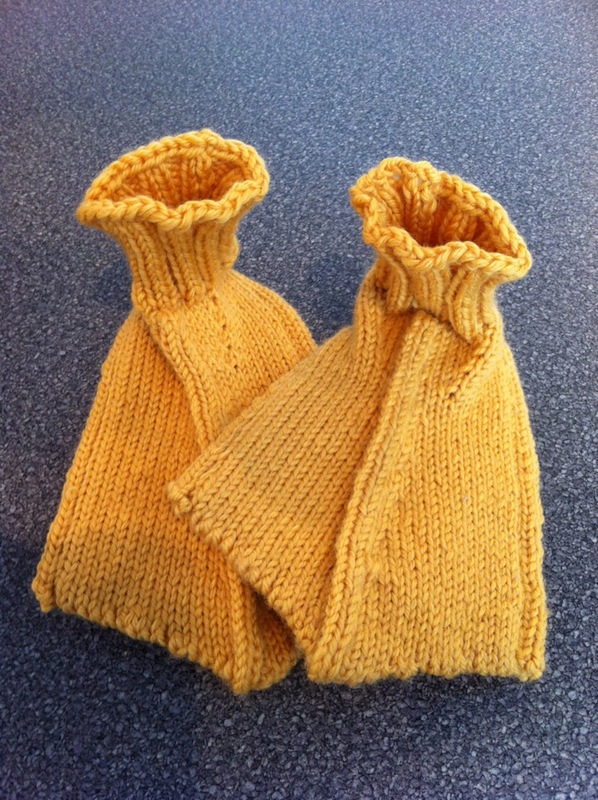 A Brief Interlude, Part 2: Knitters Are Kind | Knit Like You Mean It. Well, folks, the dissertation outline and chapter are in, and in a week I will have to defend them. Thank you all for your patience and support during this long international nightmare. Meanwhile, I seem to have gotten rather large (apparently 31 weeks of pregnancy will do that for you), and I am trying to return to real life, or whatever life this Oxford adventure is. Mr. Trask and I are preparing for the baby, which in Mr. Trask’s case involves sensible things like balancing our budget and his work calendar, and in my case involves…knitting. Of course. You all have already seen what I’ve made for the baby, but here’s something I didn’t expect: you people made things, too. And mailed them to England! Can you believe it? Duck Socks from Zoë . So cute, and a free Knitty pattern. 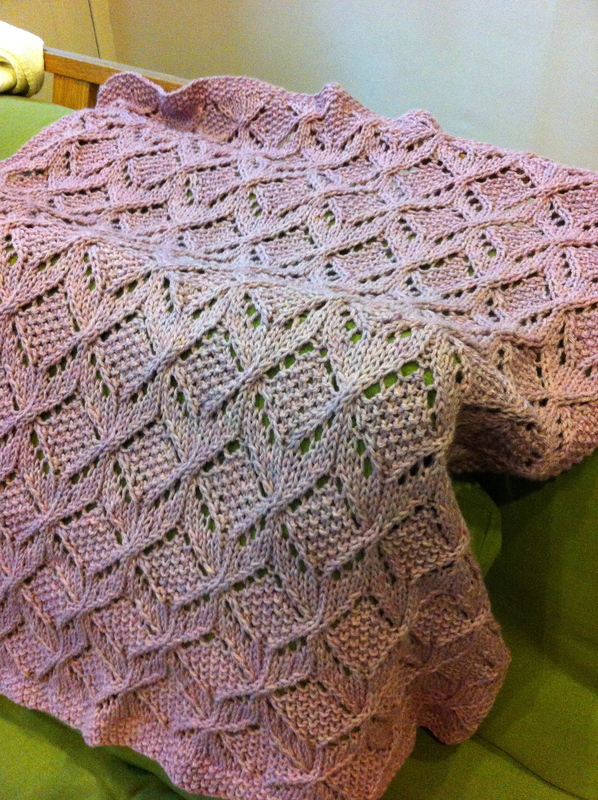 The first package that arrived was from Zoë, who lives in Canada and did some test knitting for my book a while back. Apparently, Zoe has been cranking these duck socks out for lucky babies everywhere, and she’s ready to give you advice and support if you decide to make a pair. Pop on over to her blog and let her know that you, too, dream of ducky feet. Package from Emily, who knows that knitters like to knit. The next package was from Emily, who sent me a fibre space care package: Neighborhood Fiber Co. Studio Sport and a project bag. Emily knows that knitters like to knit! I started a Baby Surprise Jacket with the yarn, then realized that the yarn just wants to be something else (does this happen to you guys?). As Emily herself pointed out, the colorway, Victorian Village, is similar to the color I used for my Tea Leaves Cardigan a couple of years ago. Tiny Tea Leaves would be an option, then, except that the gauge is wrong. 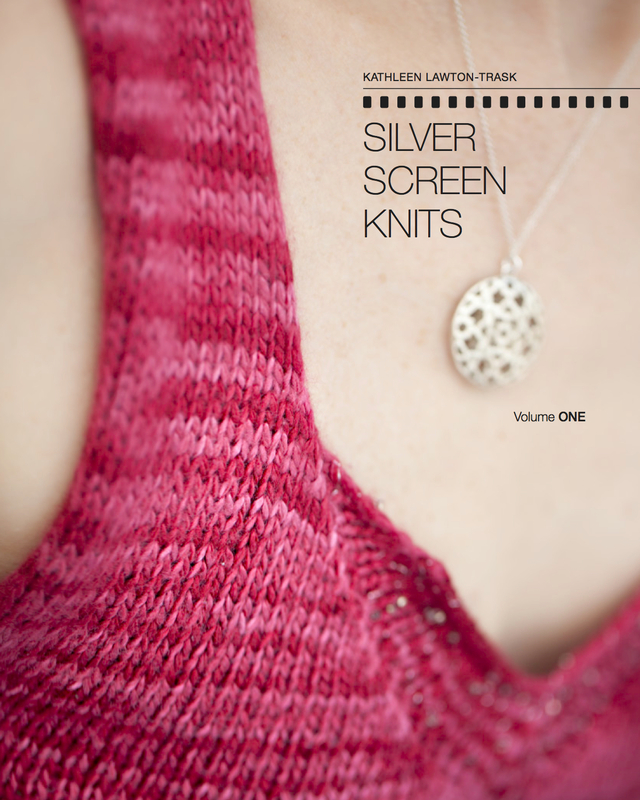 So I’m thinking about a Garter Yoke Baby Cardi. Anyone else have ideas? Amazing Blanket from Becky. When did she find the time? Becky knit this blanket in her free time…and she has a kid to chase around the house. Super-duper impressive. Who else wants to be Becky when they grow up? Moving along so you don’t have to see a pregnant lady cry – I’ll be back to a better blog schedule next week. Be aware that Sunday is Mother’s Day in the US, so you’ll be reading another Jane Lawton post from me. Forewarned is forearmed. Lastly, Jennifer R. won the handspun from Cardiff from the last giveaway. Congratulations, Jennifer! Stay tuned for a bit more yarn in the coming weeks. 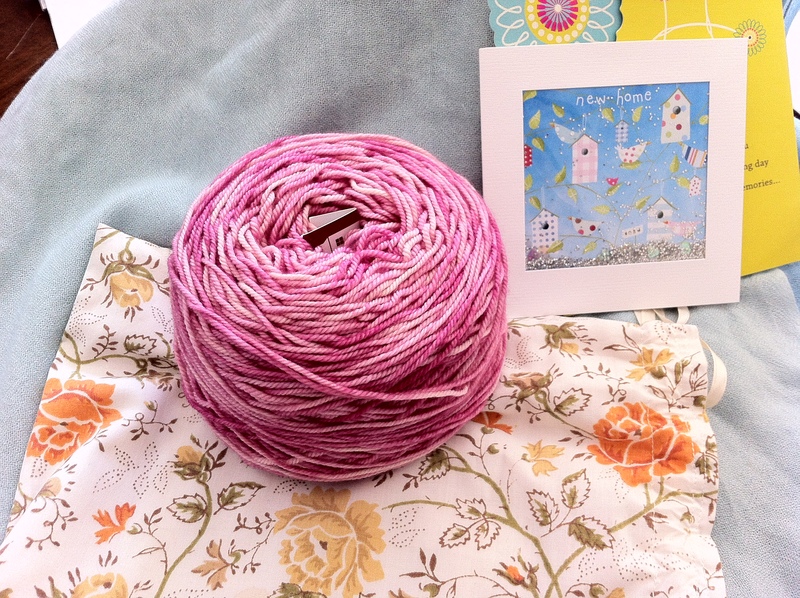 In the meantime, how about some advice on what to knit with my beautiful pink skein of yarn? I am nothing if not suggestible. Bwa-ha-ha! Kathleen thinks she’s big at 31 weeks! Bwa-ha…. 31 weeks! Exciting. Congrats on the outline and chapter, and good luck on the defence. It will be great to get that out of the way! I like the tiny tea leaves idea, but maybe you could go with Olearia instead, which is very similar but has a suggested yarn weight that is a bit closer to sport? Again…I am beyond excited to have won the handspun…a HUGE Thank You!!! I am anxiously awaiting the arrival of a nephew in June, and a granddaughter in early August. I’m certain the yarn will somehow become items for the two little ones that are joining our family. Best of luck defending your dissertation also!! !